•	Good crops from 2016 along with heavy stubbles all suggest depleted N coming into sowing – so extra N may be advisable even with late sown crops. 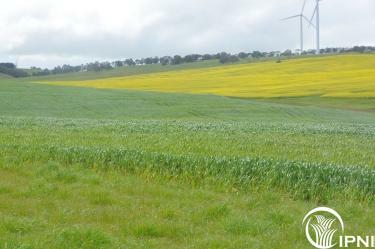 •	The decision on N is really about meeting the yield potential that is set – late sown or poorly established crops may not warrant investment. •	When comparing N sources, the rate, the timing and the placement all interact so that efficiency options vary and no single source is a “silver bullet” to all situations. •	Looking forward to 2018, N and P may carry through to the next crop, and soil testing becomes even more important when deciding on the strategy to adopt. •	Getting the right nutrient source at the right rate, right time and right place is the basis of good nutrient management. To find out more about the 4R's approach, visit http://www.ipni.net/4r. Paper for Spalding and Kimba/Cummins and presentations available for downloads below.